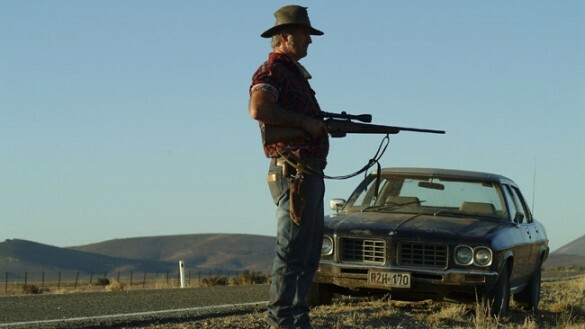 Wolf Creek 2 slated for 2014 release – It’s been eight long years since we last saw psychopathic Australian serial killer Mick Taylor, but the crazed hunter (played by John Jarratt) is back to his old tricks in Greg McLean’s long-awaited follow-up. 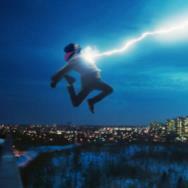 The director appeared at Melbourne’s Oz Comic-Con and revealed that the film will debut in Australia on February 20, 2014. No word yet on an American release date, but hopefully that info will appear soon. Chucky is back in a brand new Curse of Chucky trailer – Everyone’s favorite maniacal Good Guys doll is getting ready for action this October – and we’ve got the latest trailer for the upcoming Curse of Chucky to help get you in the mood. The new film appears to be getting back to Chucky’s horror roots – dropping the comedy of the last couple of entries in favor of creepy frights. That’s a good thing from where I’m sitting. Check out the clip and see what you think. Do you like the return to the classic Chucky, or were you a bigger fan of the comedic tone of the last few sequels? Ring-inspired prank goes viral – I love a good prank, and this one is pretty epic – using one of the most iconic moments from Japanese horror film The Ring as its inspiration. YouTube user (and prankster) James Williams went to elaborate lengths to scare the bejesus out of his girlfriend. Williams created a puppet that attaches to the television, set up video cameras, and then used it to terrify his sleeping significant other. Hilarity ensues. Luckily for Williams, his terrified girlfriend is a good sport – I know a lot of women who’d have left him for pulling a stunt like this. Doesn’t make it any less amusing, though. Birth of the Dead trailer looks back at Romero’s zombie classic – Without George Romero’s Night of the Living Dead, we probably wouldn’t have things like The Walking Dead and the hundreds of great zombie films that have been released in the past 40 years. Romero’s film was a game changer for zombie flicks, and the little indie film has since gone on to become one of the genre’s most enduring classics (and a cautionary tale about copyright laws). Fans will get to see just how important it is in a new documentary entitled Birth of the Dead. The new feature, due out sometime later this year, will examine Romero’s first zombie masterpiece – considering how the mood of the country at the time provided the fertile soil from which the filmmaker’s reanimated corpses rise. Get a peak at the official trailer below. In the pantheon of “unfilmable” novels, David Wong’s John Dies at the End was arguably right up there with William S. Burroughs’ Naked Lunch in terms of the level of difficulty in adapting it for the screen. This makes it at least somewhat ironic that both novels have been turned into surprisingly decent films. Phantasm director Don Coscarelli earned the right to translate Wong’s trippy, humorous horror novel for film fans, and while Coscarelli and his crew had to make a lot of concessions to make it all work, the end result is an entertaining little film that could very well be destined for cult-classic status. Describing everything that’s going on in terms of the plot of John Dies at the End is all but impossible, but the gist is that there’s a new designer drug on the street called Soy Sauce. Popping Soy Sauce grants the user amazing psychic abilities, but also leaves some of them slightly less than human when the high wears off. It’s up to the titular John (Rob Mayes) and his best bud David Wong (Chase Williamson) to not only stop the epidemic, but save humanity in the process. The duo won’t be acting alone, though – Wong will relay his story to a reporter (Paul Giamatti), and the young heroes will be joined by a famous mystic named Dr. Albert Marconi (Clancy Brown) as they work to prevent monsters from another dimension from taking over Earth. As an adaptation of the novel, Coscarelli’s film is hit and miss. It’s all but impossible to create a literal note-for-note version of the book for the screen, so Coscarelli has been forced to condense, excise and merge certain events throughout. Some characters are gone completely, while others get less time in the tale than they do in the book. This is bound to disappoint those of us who’ve read the novel. We knew this would be the case going in, and Coscarelli does an admirable job of re-creating many of Wong’s novel’s best moments (thank God the Meat Monster was in there…), but there’s bound to be something missing you really hoped would have been included (for me, it was the showdown at the Marconi convention – reading the book I kept thinking, man, I can’t wait to see this in the movie version). 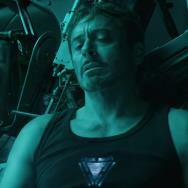 As a film, though, John Dies at the End is mostly successful. In trimming the story down, Coscarelli has managed to cut some of the excess of Wong’s novel. Wong’s book is great, but there are parts of it that feel too long or too slow or like they could have been excised completely. Coscarelli does an admirable job in taking the story and cutting what isn’t absolutely necessary. It’s not a perfect translation – if only because it feels as though it rushes through the second half, hell-bent on reaching a climax even if getting there means dropping some of the characterizations that allow the actions to make sense, but Coscarelli deserves major credit for taking something as large and unweildy and all over the place as this book’s ideas and condensing them into a mostly cohesive narrative. The tone is everything in Wong’s book, and Coscarelli manages to re-create it almost note for note. Of course, he has help. Stars Mayes and Williamson are perfectly cast as the out-there John and his slightly more grounded partner David. Williamson’s character fares better in the adaptation, if only because in the process of cutting things from the story, Coscarelli chops out a lot of John’s most hilarious moments. It doesn’t matter all that much – because Mayes makes the most of what he’s given and steals pretty much every scene he’s in. Also, I’d be remiss if I didn’t advise horror fans to keep an eye out for Phantasm star Angus Scrimm, who turns up in a great cameo appearance. It’s always great to see Angus in front of the camera. Don Coscarelli was arguably the perfect choice to make John Dies at the End. His previous experience helming the Phantasm films prepared him when it comes to making a film where the mood and atmosphere are more important than all the narrative elements adding up logically. His adaptation of Joe R. Lansdale’s Bubba Ho-Tep gave him experience with bringing a book to the screen. 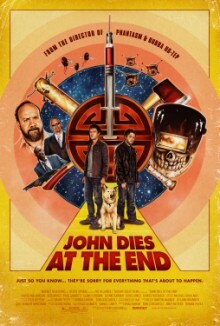 All of this works to John Dies at the End’s advantage – and the film benefits greatly from Coscarelli’s expertise. In the hands of a lesser director, I don’t believe the adaptation works – the story is too out there, too convoluted and bizarre. It takes a filmmaker of Coscarelli’s pedigree to figure out what’s vital, what isn’t, and how to reshape the story into a whole that works for a wildly different medium. As challenging as that was, Coscarelli has succeeded. John Dies at the End is not a perfect re-creation of David Wong’s novel, but it manages to capture the spirit of the book while making it accessible for a new audience. That certainly deserves some respect. After a relatively quiet summer, things finally heat up for horror fans at the box office. While not technically horror, I know a lot of fright fans will be turning out to support Guillermo del Toro as he releases his giant robots-vs.-monsters flick Pacific Rim tomorrow. Here’s to hoping it lives up to the hype. If you’re looking for something a little more traditional, the highly regarded sequel to V/H/S (imaginatively titled V/H/S 2) is out in limited release as well. Things really get crazy on July 17, which sees the release of James Wan’s The Conjuring. Early buzz for this ghost flick has been overwhelmingly positive, and now we’ll all get to see it for ourselves. Hopefully it finds success – would be nice to see more horror flicks occupying major summer slots. If you like your horror more comic book oriented and funny, Ryan Reynolds and Jeff Bridges star in R.I.P.D., which also releases that week. 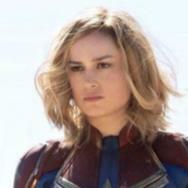 I’m not getting a good vibe from it, but maybe the whole film will be better than the trailers. And last, but certainly not least, is the limited release of Steven C. Miller’s Under the Bed, which features two brothers teaming up to battle a monster located… wait for it… under the bed. July 16 is going to put a bit of a hurting on your wallet – there’s some great stuff coming out next week. Things kick off with the DVD and Blu-ray release of Fede Alvarez’s gory updating of Evil Dead. There will be blood in this one, trust me. After that, we’ve got a Blu-ray and DVD version of two Mario Bava classics – his mesmerizing anthology film Black Sabbath and his “lost” exploitation classic Rabid Dogs aka Kidnapped. Don’t miss out on these discs! With so many great titles debuting on July 16, July 23 doesn’t offer up much to get excited about, but look at it this way: you can actually afford food this week instead of blowing all your money on movies.